The design for this quilt came from a landscape painting on a calendar from the artist Glenn Smith. I sketched out a quick cluster of colors to layout in the watercolor style of quilting, concentrating on the floral patterns with the budding trees as the background. I don’t work very often with pastels but I was trying to capture the feel of everything starting to bud out in the Spring. Once the quilt squares were selected and pieced together, I hand quilted in various colors of Sulky threads to highlight the flowers. 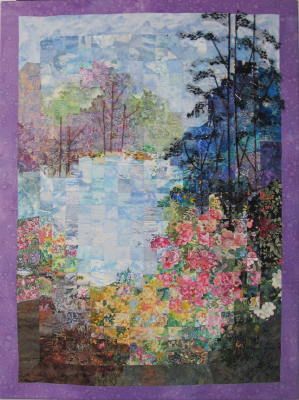 The trees in the background were then overlaid with metallic tulle in shades of lilac and pale green to create a hazy appearance.The larger tree on the right side of the quilt was created with textured yarn for the trunk and black lace for the foliage. This portion of the quilt was completed after the quilt had been stretched on a wooden frame.